"I saw dramatic results after only the first session with the collagen laser. I can't wait to see how great my skin looks when the series is done!" "I really, really liked it! I'm a physician and it was great to find specialists who were down to earth and knowledgable. The staff is a 'cut above' excellence and I appreciated the one-on-one education." "… one of the best gifts I have ever given myself. When I walked into the spa, I immediately felt relaxed. As I sat in the waiting area, I heard the sound of water and smelled the wonderful fragrances and I knew I had found a home. With the first treatment, I could tell a noticeable difference in my skin." "Blue Water Spa is an oasis of peace and solitude in this busy world. Their staff are consistently professional and kind, not to mention excellent at every service they provide. I routinely recommend them to friends, family, and patients. p.s. the massages are awesome!" " … such a wonderful experience to be so pampered! They go 'above and beyond' the expected." "The best gift I ever received was a gift certificate to Blue Water Spa! Not only do I look years younger after Botox and no-test collagen, but I feel better than I have in a long time. The staff is warm, friendly, professional and exceptionally skilled. They make me feel like a queen whenever I visit." "…a staff and services which raise the bar for the Raleigh area. Their massage therapist has the perfect combination of strong hands and superior techniques. She has given me, by far, the best massage I have ever received!" "I've visited many spas around the country and Blue Water Spa is by far the best I've experienced. The staff treated me like royalty and made me not only look beautiful, but truly nourished my soul." "The office is absolutely beautiful. I love the relaxing environment and that the office is staffed with highly trained aestheticians and registered nurses. I recommend Blue Water Spa to all my friends." "…a soothing, relaxing experience… and my face felt wonderful too." "… It's a wonderful place and the atmosphere is so pleasant and relaxing. I've noticed such a difference in my skin only after two treatments. I'm excited to see the results after my series of six." "Prior to coming to see Dr. Law, I had never had Botox or collagen treatments. Dr. Law and the staff answered all of my questions and made me feel so comfortable. I love the results! I look ten years younger"
"… my skin has never felt better and I enjoy the compliments I receive about how wonderful my skin looks." "…a great place to be pampered. The staff really cares about you and takes pride in what they do." "The best massage I've ever had. I feel that the staff at Blue Water Spa truly cares about me as an individual. The combination of professionalism and caring is rare and refreshing." "Blue Water Spa is fantastic. They offer big city services, expertise and products in Raleigh! What a treat! "You and your staff made me feel like a queen today. Thank you so much for such a nice experience. Lisa was fantastic, such an asset to your staff. It was wonderful and I already feel better about myself. You all have a wonderful, customer-focused business. Customers want to see more of this type business. I wish you much success!" "To anyone who has not been to enjoy the experience at Blue Water Spa–you need to go! I have personally experienced facials and microdermabrasion and my husband has had several massages and truly felt relaxed. The entire staff is well trained, knowledgeable, professional and friendly. The service that you will receive is excellent; you are made to feel that you are the most important person there–because you are, to them. Blue Water Spa has so many things to offer. I am looking forward to enjoying all they have to offer. It is a true five-star experience." "Blue Water Spa is a beautiful and serene setting for some of the best treatments I've ever had. Iï¿½m so happy there is finally a spa like this in Raleigh!" "I had no idea what microdermabrasion was in February. Now I look forward to every session! This is a must for us "baby boomers." "Microdermabrasion rejuvenated my skin making it feel softer, smoother and gave me my glow back!" "I love the microdermabrasion. I have had several treatments and can tell a wonderful difference on my face. Blue Water Spa is very professional and first class in equipment and staff. I would highly recommend Blue Water Spa." "My visit to Blue Water Spa was extra special. What a treat… and I'm looking forward to experiencing it again soon. I appreciated Kile's and Dr. Law's expert opinion on what cosmetic enhancements are available. What a pleasant surprise to hear them say they didn't feel I needed the enhancements. The atmosphere was relaxing and comforting, adding to such a professional, caring staff. Dr. Law is pleasant, warm and friendly. I have recommended Blue Water Spa to all my family and friends." "It is a peaceful haven to escape the stresses of life. My microdermabrasion made my skin come alive and I have my pre-pregnancy skin back." "I feel Blue Water Spa places more emphasis on skin care and maintenance from the 'inside', rather than just rubbing creams on your face and calling it a facial. I highly recommend this spa to anyone who asks me where the best place in Raleigh is for spa treatments."." "The laser treatment I had was so fast and effective. I couldn't believe that after 15 minutes, something that made me feel self conscious for years was simply gone. It was amazing."" "I have spider veins on my nose and have never had a laser treatment before. The result was wonderful. My nose looks better than it has in years. I realize now that Blue Water Spa is more than just a relaxation spa–they show results.". "The aestheticians take their time and make sure you leave clean, comfortable, and with plenty of sunblock. Blue Water Spa is the best and most enjoyable spa experience I've ever had. I've been to several other local facilities and there is nothing as high in quality in the area for the price. I have referred several of my friends because I know they will receive excellent care and will be delighted with their results." "Recently I treated myself to four hours of extreme bliss (microdermabrasion with endermology, body brushing and a massage.) The combination of these treatments left me feeling like a 'Serene Queen!' It is great to have Blue Water Spa here in the Triangle. They continue to provide new and exciting treatments and products. I just marked my one year anniversary with Blue Water and I can't say enough about how grateful I am. I never thought my skin would be this stunning. Thank you so very much." "Blue Water Spa, combined with the medical practice, has been a wonderful experience. The spa is luxurious and peaceful, and the staff is fabulous – truly a pampering experience! On the medical side, it would be hard to find, or even expect to find, a more positive and skilled professional than Dr. Law. My experiences with the medical staff and Kile have far exceeded my expectations. I would recommend both without reservation and with the highest praise." "Between the treatments and using the excellent [medical-grade] facial products, I have seen incredible results in 6 months. The staff is extremely professional but also friendly and comfortable. " "Today, I had my 5th or 6th facial from MariBeth, and I just had to write and say this woman is fabulous – she gives the best facial anywhere. And we've been to spas all over the world. She and the treatment – are both gems!" "From the moment I entered the door until I left, I felt like I was treated respectfully, professionally, and most of all, I was pampered. I received a facial from MariBeth, who did an excellent job. She used every minute of the time I scheduled and was so talented in her massage and each step of the facial was so soothing and relaxing. When I got in my car to leave, I telephoned my husband and told him I did not believe I would be able to drive home. I told him I felt like I knew what heaven would be like. He was so happy and urged me to make another appointment very soon. I have been to three spas in Raleigh and none compare to the service I received at Blue Water Spa. I wish you many years of continued business." "The facials are out of this world! In my opinion, Blue Water Spa doesn't compare with any other spa. I just cannot say enough good things about Dr. Law and his amazing team. They pay attention to detail and truly care about their clients. They go out of their way to make you feel comfortable, and in doing so, make you feel like the most important person on the planet. " A Peaceful Oasis for a busy Mom – By Gwen B. "Attention, Attention anyone in Raleigh, North Carolina seeking a tropical paradise, an oasis or peaceful hideaway Blue Water Spa is the place for you!!! My first time at Blue Water Spa was on Valentine’s Day several years ago, when my then boyfriend, now my husband purchased an amazing spa package for me. From the minute I arrived they went above and beyond customer satisfaction. I was greeted with warming smiles as soon as I walked in. Everyone seemed genuinely happy to see me and to take care of my every desire. My first time experience there is one i’ll always remember and that is why I continue to back time after time. My most recent Blue Water spa package was the best experience ever. From the moment I walked in until the time I left, everyone who took care of me was courteous and professional. I had one of the best facials ever, my skin glowed for days and the massage was heavenly. My fabulous husband also included a foot fantasy with this particular package. I have never experienced two therapists massing me at the same time. Jennifer was performing a facial and upper body massage while Micki was massaging my feet and lower legs with just the right amount of pressure. It was so extraordinary I thought I might cry. Thank you Blue Water Spa for providing years of stress relief, fantastic results and genuine warmth to me and to your clients. And thanks to my dear husband for always knowing the best gift to get your wife for any occasion! I’m hoping to find a gift from Blue Water Spa under the Christmas tree this year too. And, I think I’ll get one for my dear husband. " You must experience this spa at least once in your life – By Leslie R.
"I am rarely moved to posting user reviews unless I have an exceptional experience, one way or the other. My visit to Blue Water Spa this week was truly exceptional, in the best possible way. It is elegant, warm, and beautiful. 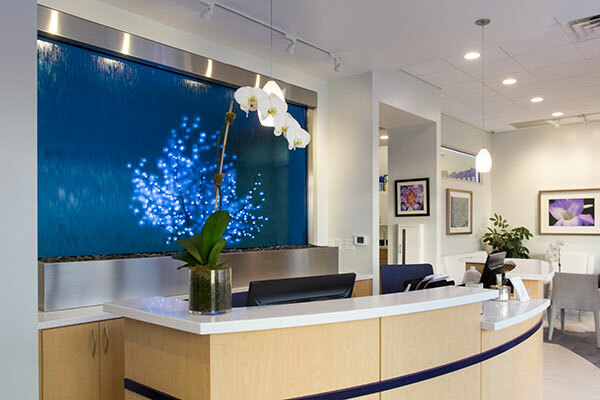 Every detail is even better than one could imagine from the delicate natural fragrances of their waiting area to the amazing and truly healing sights and soungs of the two floor to ceiling waterwalls. I honestly felt my stress melt away upon entering the spa. I could tell from my phone calls to them that I would be treated well and they exceeded my expectations, even helping me pick a restaurant to go to after my treatments (and calling ahead for me too!) which was great. I booked The Blue Water Bliss (listed on their web site) and it was amazing. I had a deep tissue massage and it was incredible. My therapist explained everything to me in advance, checked about pressure and temperature, and let me relax and enjoy her wonderful technique as well as the essential oils used for this treatment. Then I had the Signature facial which I had heard about from true spa junkies claiming it was the best ever and I must agree. It was absolutely delicious. I can honestly say it was the most thorough AND most relaxing facial I have ever received. And I’ve had many, many facials before, all over Los Angeles and spas all over the place. The products are lovely–gentle but very active–and my skin looked and felt absolutely incredible afterwards. Days later it still looks glowy, toned, and hydrated. All in all, this was the best spa experience I’ve had, from my first call through my treatments and of course enjoying the results afterwards that everyone has noticed. Relaxation+results= I’ll be back very soon!" Best Birthday Gift Ever – By Michaela S.
"My husband gave me a spa package at Blue Water Spa for my 40th birthday and it really was the best gift I have ever received. I sometimes think gift certificates can be impersonal, but he really thought about this. He told me that he not only went to the website of all the spas in Raleigh but he visited all the spas that were popular. I was really touched that he went to that much trouble. And, he was right. Everything about Blue Water Spa was honestly beyond my expectation. The environment is gorgeous, elegant and very relaxing and the satff is beyond compare. They seemed to know who I was, why I was there and seemed genuinely happy to see me. I had a package that included a facial, a massage and a foot fantasy. The massage was incredible, but the facial (with the amazing massage) and the foot fantasy simultaneously is somethign every person should experience at least once in their lifetime. As much as I loved the body massage, I have never experienced anything quite like the Blue Water Spa facial massage. To say my face felt happy is not nearly enough. I never take time to write a review but Blue Water Spa is so exceptional and everyone there really really cares about making each guest feel happy and important. Thank you my dear husband for taking the time to vivist each and every spa in the area. Thank you for choosing a gify that in your words is somethign “I really deserve” HUSBANDS, PAY ATTENTION. If you don’t have time to check out al the spas yourself, you now know to go to Blue Water." Truly A World Class Spa – By Annie F.
"I just moved here from San Diego. I love Raleigh, but I am missing my routine and my favorite places to shop to dine and mostly to spa. I went to 2 other spas in the are before discovering Blue Water Spa. One spa was adequate. The other was simply horrible. I was so dissapointed. I was referred to Blue Water Spa first by my pilates trainer and then by the gal who owns my favorite boutique. At the recommendation of my trainer I got a Blue Water Spa facial. I was floored. This was honestly the best facial I’ve ever had in my life. Really. Ever. It was the most relaxing treatment I’ve ever had. Better than that, my skin glowed after the treatment. My husband and even one of his golfing buddies noticed my skin. My husband has nejoyed spa treatments too so I scheduled a facial for him. The facialist told me that if I ever want something really special that I should get a facial and a foot fantasy together. It is the facial I described with a facial massage, arm massage and upper body massage while a second therapist massages the feet and lower legs. I scheduled this treatment for my husband and he told me he has never has a better treatment anywhere. he went on and on about hoe great it was. he enjoyed it so much that he purchased a gift certificate for the same treatment for me. I really am so excited to have found Blue Water Spa in Raleigh."